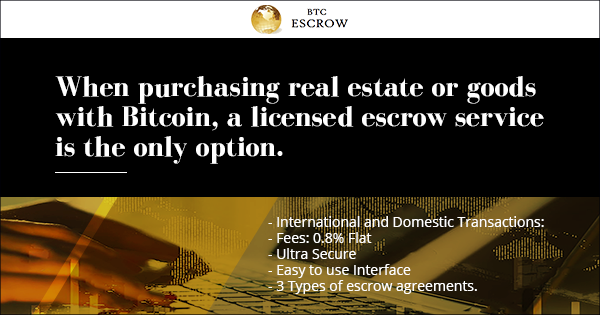 Correx will offer escrow services in any cryptocurrency that they currently offer. All the majors are certainly included. Correx.io, fast becoming one the world's most popular crypto exchanges, has added yet another feature to it's growing list of services. In early October, they launched a Bitcoin escrow service for three different kinds of contractual agreements involving the use of Bitcoin as consideration: Purchase agreements, for transactions involving real estate, goods, and services; Loan agreements, for lenders that accept the virtual currency as collateral; and Security agreements, where Bitcoin is pledged to secure performance of a contractual obligation such as a bond or surety. In addition, they are the only Bitcoin escrow service which is registered as a money services business with the US Treasury. Their fees for maintaining these kinds of escrow are set at an industry low 0.8% flat. Both domestic and international transactions will be accepted and all escrow proceeds will be maintained off site in multisig wallets. In fact, now that the exchange offers 47 pairs to trade, Correx will offer escrow services in any cryptocurrency that they currently offer. All the majors are certainly included. * For more information regarding media usage, ownership and rights please contact Correx International Inc..